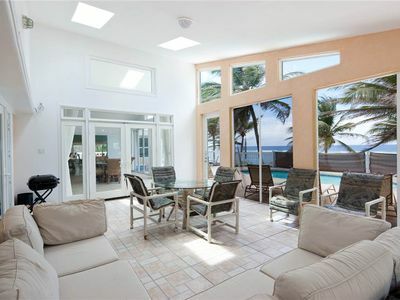 This newly listed penthouse condo has everything for your perfect vacation. 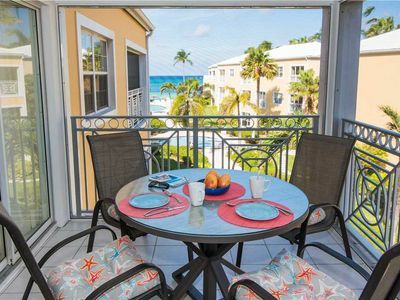 Enjoy stunning views of the sun setting over the Caribbean Sea from your private balcony. 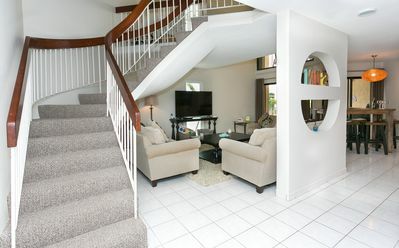 Located in a resort style complex with a great amenities. 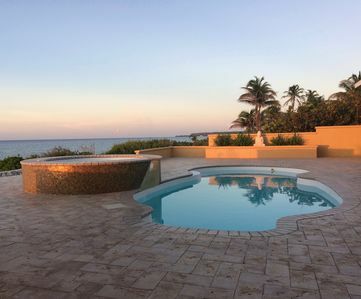 This top floor unit offers stunning views of Seven Mile Beach, and on of three pools available to you from your substantial private balcony. 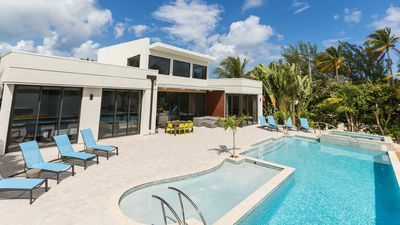 The fully stocked kitchen includes stove, french door refrigerator with water filter and ice maker, dishwasher, both drip and Keurig coffee machines, toaster, electric kettle and all the cookware necessary to make a gourmet meal. 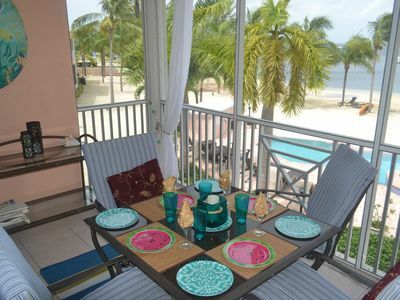 We provide towels, beach towels, extra pillows and linens, shampoo and soap. 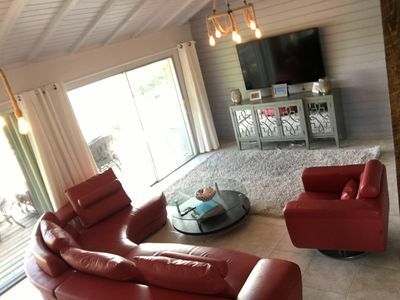 The unit has 65" smart television (cable and Netflix included), fiber optic cable / internet circuit with HD and premium channels and great Wi-Fi coverage. 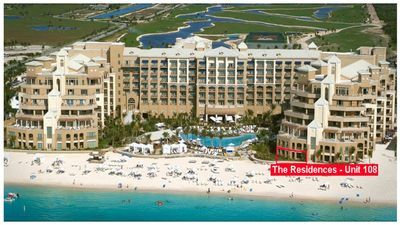 The condo is located at the Sunset Cove resort style condo complex on the world famous Seven Mile beach in Grand Cayman. 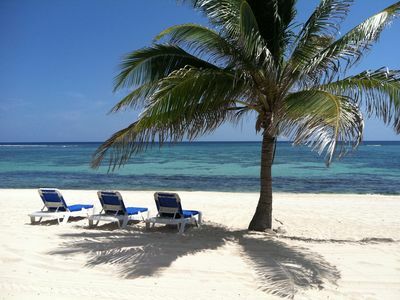 We share facilities with the neighboring Margarittaville resort so you have access to three pools! Four on-site restaurants and more! 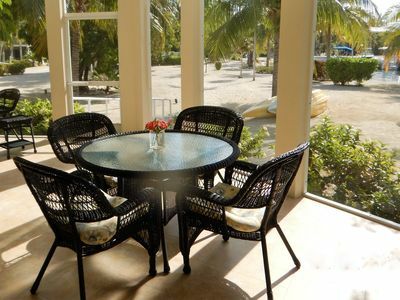 The resort offers many great amenities. Join other guests at the beach at sunset for stunning views or relax on your private balcony and take the views from there. 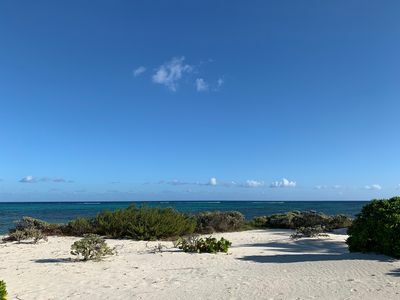 The soft white sands lead you into the cove area where the cove forms a protective barrier allowing for gentler ocean swimming and snorkeling. For the adventurous types, swim beyond the cove area to discover a natural coral reef for your snorkeling pleasure. 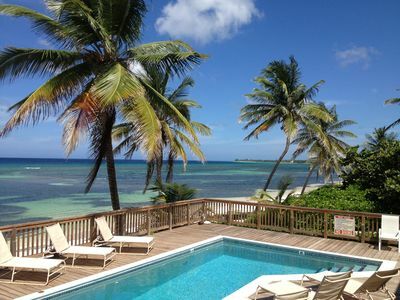 After your ocean dip, why not chill out in the large pool with a swim up bar to the on-site "5 O'Clock Somewhere" restaurant. The large pool also has a mini lazy river, a waterfall, a shallow "kiddie pool" area for families with young children and a hot tub. 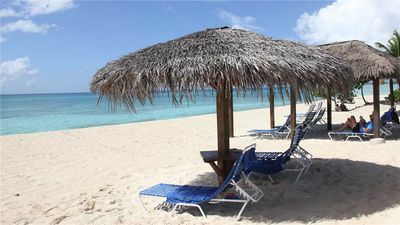 Other on site-facilities include a BBQ area, plenty of lounge chairs and beach umbrellas. 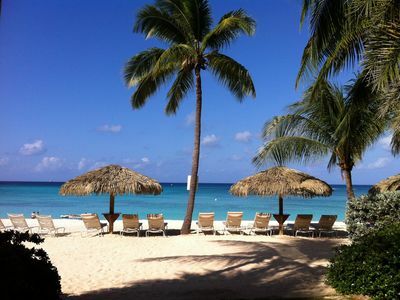 Whilst vacationing in Cayman, I will be more than happy to help you in any way we can. We are locals here so know all the best spots and activities to check out to make your stay more enjoyable. I will also provide you with a cell phone with local coverage. 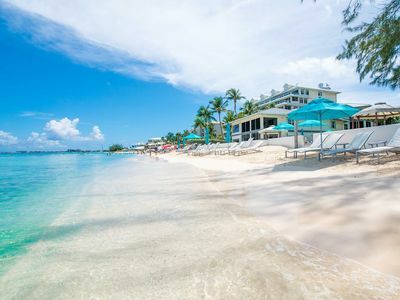 The place is ideally located on Seven Mile beach which is the hub for entertainment, restaurants and activities in Grand Cayman. 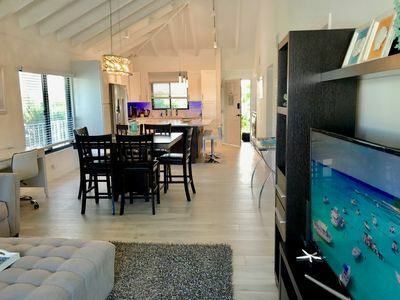 We are situated within walking distance to Camana Bay, Georgetown, the top restaurants, a large grocery store, tour operators and several dive shops nearby and of course the beach. If you choose to venture out further, you can either rent a car or have a taxi pick you up at the doorstep. 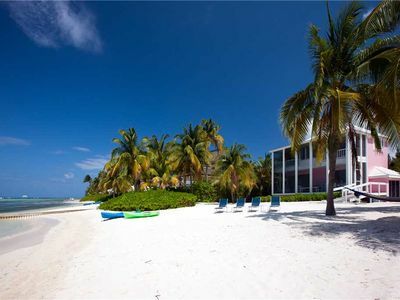 Alternatively there is public transportation on our road, West Bay road that travels along the Seven Mile Beach strip. If you are taking part in an organized tour, most tour operators will have door to door transportation. 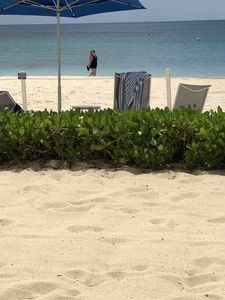 Whilst vacationing in Cayman, I will be more than happy to help you in any way we can. I'm a local here so know all the best spots and activities to check out to make your stay more enjoyable. 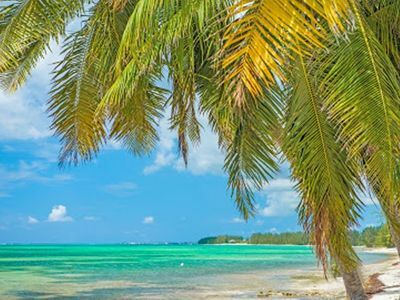 My place is ideally located on Seven Mile beach which is the hub for entertainment, restaurants and activities in Grand Cayman. 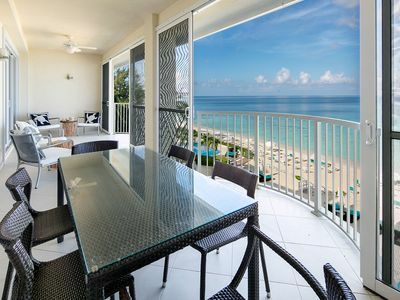 We are situated within walking distance to Camana Bay, Georgetown, the top restaurants, a large grocery store, tour operators and several dive shops nearby and of course the beach. If you choose to venture out further, you can either rent a car or have a taxi pick you up at the doorstep. 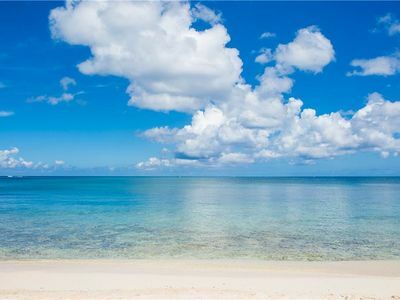 Alternatively there is public transportation on our road, West Bay road that travels along the Seven Mile Beach stripe. If you are taking part in an organized tour, most tour operators will have door to door transportation. Finally we have two huffy style bikes available for your daily use. These are great for taking runs to the grocery store or venturing along seven mile beach. The condo uses a key-less entry system so you don't need to worry about carrying keys around. It will be programmed with your unique code for during your stay. There is also 24x7 security guards on premises and CCTV. "Everything about this place is first class!"